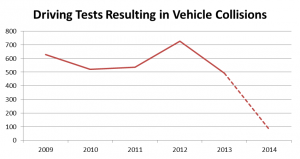 New research by IntelligentCarLeasing.com reveals the number of driving tests resulting in collisions with other vehicles over the past 5 years; identifying some interesting trends and predictions for the future. Probably the most interesting finding from the data is that the number of collisions reported for the first quarter of 2014 shows a huge predicted fall in driving test crashes this year . 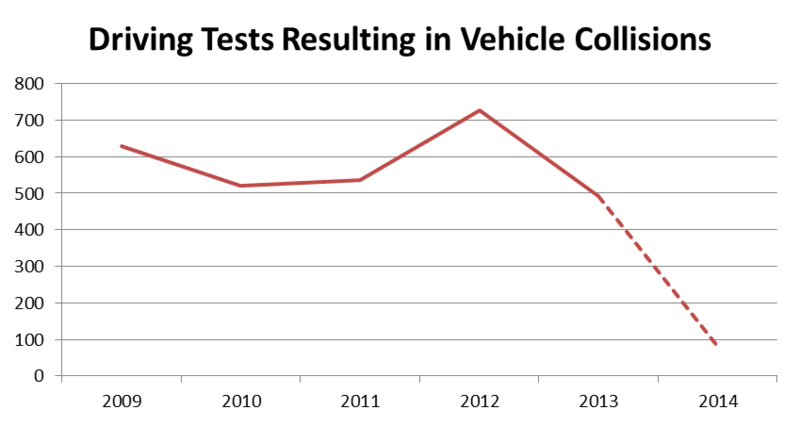 With only 20 collisions recorded so far in 2014 during driving tests, the extrapolated year end crash rate would be only 80 collisions. This is a huge drop from the already reduced level of 491 in 2013! The worst drivers at the bottom end of the spectrum have improved their standard of driving; resulting in a reduced amount of collisions. The reason why this would be the case rather than the top end of the spectrum improving is that pass rates have remained fairly steady. Another explanation could be that driving examiners are becoming more proactive in taking preventative action and stepping in at an earlier stage when a dangerous situation arises. Quite surprising stats I must say, shows that improvements are always being made.